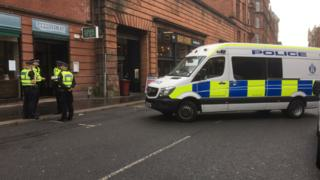 A 47-year-old man is in a critical condition in hospital following a large-scale disturbance in Glasgow city centre after Sunday's Celtic-Rangers game. Two other men, aged 29 and 30, were seriously injured in the incident shortly after 17:00. Police cordoned off a number of streets in the Merchant City around Albion Street, Ingram Street and Bell Street. The attack on the 47-year-old man is being treated as attempted murder. It is understood that one line of inquiry is that the incident was connected to the earlier match at Celtic Park. Det Insp Peter Crombie said: "We are currently going through CCTV and speaking to those who were in the area at the time to try to establish exactly what happened here. "We are treating the attack on the 47-year-old man as attempted murder, and the attacks on the 29 and 30-year-old men as serious assaults. "There may have been more people injured in this incident who did not seek medical treatment last night and we would appeal for them to come forward and speak to us." He added: "We also know that there were a number of people in the area who may have got caught up in it, or stopped to see what was going on. We would ask these people to check back and see if they have any mobile phone footage or images that can help us. "If you were driving in the area, you may also have dash cam footage that can help - either prior to the incident taking place or in the aftermath."